Recently while delivering a retail workshop I was approached with concerns around what retailers should be focusing on – marketing wise. After helping her, it made me think about how much our customers have changed both sociologically and psychologically. And how little we’ve adapted our messaging to reach them. Sure we have lots of new social and digital ‘tools’. However, our obsession with products, pricing and features and benefits have not adapted to our New Customer. More importantly, our blinders on; sales, digital experience and love for products has put us at odds with the NEW customer. In my experience of being a large (2500sqm) successful retailer (28mil per yr in turnover) for over 11 years, it can be exhausting finding fresh new ways to reach and connect with your customers. So, here’s 3 mistakes I was making as a retailer and some ways to fix them. Retailing is no cake-walk these days. And we make it harder on ourselves by focusing so much time, money and resources on the top 3% of customers who are ready to buy now. In the “Ultimate Sales Machine,” Chet Holmes says that only 3% of your target market is ready to buy something from you now. 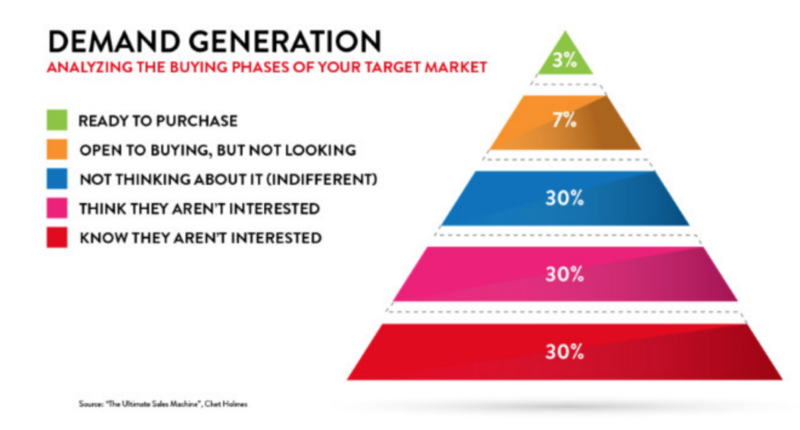 As you can see by the image below, that means that 7% of your target market is open to buying but not looking (now), 30% of your market are comfortable with the status quo and 30% of your market believe they are not interested. As retailers, we focus the majority of our marketing efforts on the top 3% of people who are ready to buy now. The bad news about our obsession with the top 3% is that’s exactly who your competitors are trying to reach as well. In our current world of retailing, you’re paying to reach (digital advertising or traditional) the same exact people that your competitors are and it’s a battle of who spends the most in many cases. But, it’s also crucial that we don’t lose sight or ignore the 67% of people who may be our future customers. Worth 3 x annually what non-engaged customers are worth. So, it’s definitely something worth listening to. But it’s nearly impossible to engage and add value to customers if you’re solely focused on selling. Interested in Mr Holmes, “Demand Generation,” I started experimenting (in my own store) in reaching the other 67% through in-store customer events and experiences. It was through these ‘experiments’ that I discovered how great events are at increasing sales, visitation, profit and of course merely re-connecting and building trust with your local customers (which is why the sales increase happened in the first place). Later, I wrote about my findings in a book called The Retail Experiment. Helpful in-store events not only reach the top 3 ‘percenters’ who are ready to buy now but also helps you build long-lasting customer engagement for 67% of potential customers that your competitors are completely ignoring. There has never been a better time to start engaging and building trust with the other 67% of your future customers through in-store experience. According to the NAB, brick and mortar sales account for 92% of all retail sales in Australia. So, the lowest hanging ‘marketing fruit’ for brick and mortar retailers is improving your in-store experience. One of the biggest opportunities, outside of having plenty of great trained staff available to help your customers, is having special experiences that emotionally connect customers to your store. In my experience (in developing over 300+ of these bespoke events), those aimed at inspiring or educating customers tend to be the most successful. My advice for those wanting to explore in-store customer experience is to create unique events that capture your own brand promise while purposely helping your customer to reach their own aspirations. It’s about building an emotional journey that takes both of you (you and your customer) where you each want to be. So definitely keep doing all the fantastic digital customer experiences (remember that’s probably where your customer will start anyway). But, don’t forget about the 92% of people that are getting into their cars and driving to your store – make sure you’re focusing on their experience too. This is especially true for us retailers. When we’re honest and evaluate our current marketing catalogues, social posts, EDM’s (email) and in-store merchandising – retailers are not really that crash-hot at falling in love with customers either. Posted all over our websites are price and product messaging, in-store we find more products than you can poke a stick at. A store jammed to the rafters with products doesn’t leave a lot of room for experience or discovery. Stress and anxiety are typical for the Modern Customer today. And, stress impacts how and why we shop and buy. 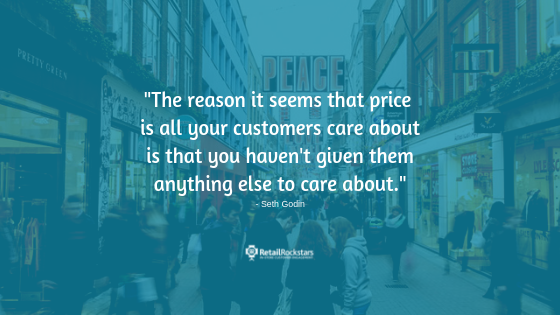 So think about your store from your customer’s perspective. In our tech-crazed busy days, too much choice is overwhelming. Cut-back on your range of common products (remember you can still sell them online). Instead, source more unique-to-you products. Focus on taking your customer on a visual & experiential journey and range unique products that can tell that story. YES, this directly contradicts sales per square metre philosophy. Carve out the space in-store to create lifestyle displays that inspire. Host meaningful events that genuinely help and educate your customers. Rather than adding to your customers’ anxiety, be the solution by helping them to easily make the right choices in the store. Lastly, balance your messaging with appropriate ways you could assist them to achieve more in their day (time), make smart choices (financially or realize the value of a better quality product). Start today, just like reviewing sales reports, make in-store experience a part of your weekly planning. Start focusing on marketing that’s for those ready to buy as well as plan some events to educate and help future customers in-store – mix it up a little! Finally – if you have a brick and mortar store celebrate it! Pure play online stores don’t have the luxury of people, of touch, smell and visceral experience. But don’t waste this wonderful space, get creative and get experimenting! Creating a digital marketing for business can be really beneficial: it means website is regularly updated, which can help with search engine optimization (SEO); it can provide value for customers or potential customers by answering their questions and reassuring them about your product or business; it can position as an expert in your field and build credibility. Yes digital is extremely beneficial for retailers, but with only 8-10% of all retail sales occurring online, Brick and Mortar stores need to also focus on more than just digital to build experience.